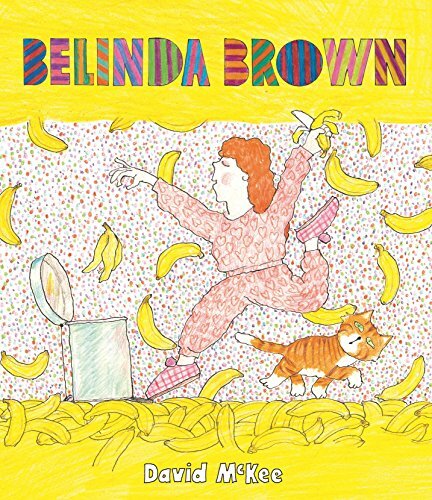 Your average fussy eater would surely pale into insignificance alongside banana-obsessed Belinda Brown. This young miss demands the yellow-skinned, bendy fruits at every meal and in-between (she keeps a spare tucked into her sock) and refuses to eat anything else. She even falls out with best friend, Felicity Jones over a banana incident. Mealtimes in the Brown household are lengthy, interesting times with family members all gathering together to discuss current affairs, art and the weather; and all the while Miss Bee is stuffing herself silly with, bananas. Her mother is convinced Belinda is going through a passing fad; her gran however is concerned. So much so that one day she urges the child to accompany her on a talking walk. Gran’s worry is that over consumption of bananas will result in an undesirable body curvature. Now even Belinda isn’t keen on this and so takes remedial action courtesy of a heavy weight. This she places on her head beneath her hair, but the result is not exactly what she’d been hoping for. This totally daft tale is documented in David Mckee’s zany inimitable illustrative style and accompanying bouncy rhyming text. Every one of his characters is memorable and the portrayal of the banana sharing twins, a particular hoot.